By early November most had lost all hope that the dismembered body found near St. Mary’s would be identified or the killer brought to justice. The Sugar Creek Horror looked to be yet another “cold case,” a hideous murder without solution. Just another instance where justice was but a forlorn and empty word. But then, on a stump, appeared an insurance policy taken out to insure household goods. On it was a name, Susannah Nelson and an address in Anderson, Indiana. How did it suddenly appear, and who put in there? Was it someone involved in the murder who had been cut out of their share of the loot? Did someone just find it, but not want to get involved? Why wasn’t it found before? A spiritualist later even claimed that someone from the spirit world had placed it there to ensure the victim’s soul could find peace. Nonetheless it was there. 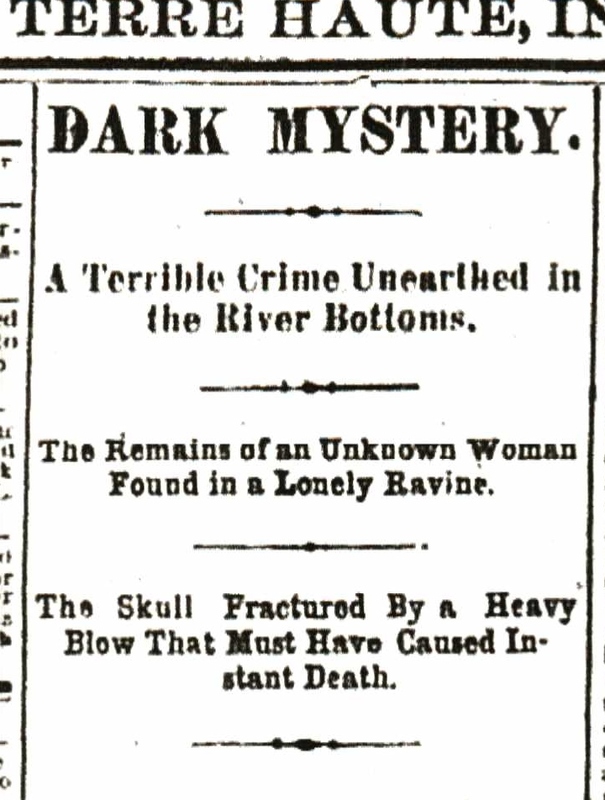 It was found by Webb Bayless, a tall man with a black moustache well known saloonkeeper in Macksville. He had gone to see the murder scene with a blacksmith friend named David Henry. In the hollow of a stump beneath dirt and leaves Bayless and Henry said they found torn pieces of paper. Several pieces were stained with blood. Bayless and Henry noticed a stick pushed into the ground near the stump. Upon pulling it up they found it was wrapped in a woman’s hair. Bayless took the grisly find to Vigo County Sheriff Cleary. The torn papers were an insurance policy covering the household goods of one Susannah Nelson of Anderson, Indiana. Anderson police were contacted in an attempt to find out what they knew about the victim. It turned out she and her family were well known to them. Susannah Nelson was 69 years old. Widowed since 1869, she had four sons. She came from a family of Madison County farmers named Bronnenberg, five of her brothers were prosperous land owners. But Susannah had taken a different path and was estranged from her family. The Anderson authorities were contacted and reported that Susannah had a long history of prostitution and was the madam of a brothel. Her reputation was characterized as “disreputable” by many who knew her. Terre Haute detectives went to Anderson where the local sheriff took them to Nelson’s brick house on Main Street in search of evidence. One of tantalizing clues was a letter from her youngest son, Jasper Nelson reportedly asking her to come visit him in Brazil, or possibly Terre Haute as he was ill. Another letter was mentioned in which Susannah wrote to a “friend” asking if she thought Kansas City or Omaha, Nebraska (near where another of her sons lived) either place was a good location to open a brothel. Detectives (including Webb Bayless, amateur detective) interviewed numerous people in Anderson try to piece together Nelson’s movement. They established that she had taken a train to Indianapolis on September 6th. She was in the company of a man named Perry Manis. They appear to have left Indianapolis on a west bound train the next day. Unconfirmed reports said she was seen in Brazil with her son. She spent at least one night in Terre Haute where she “put up” at a seedy “hotel” that had a bar and a back alley. It was known as a place where “girls could go with company and get rooms.” The next day she was seen heading west in a buggy with a man (rumors flew that she visited a home in Macksville and was known there as a wealthy woman, but that is almost certainly just gossip). Then, Susannah just disappeared from sight, until her scattered skeleton was found in the murky ravine in Sugar Creek. With her identity confirmed the focus turned to finding her killer. It was not long before Susannah’s youngest son, Jasper, became the prime suspect. Jasper was a ne’er-do-well, wastrel son who often turned to his mother to bail him out of difficult situations. Jasper was known as a “bad character.” He most often contacted her when he needed money That was likely the case when he wrote her the letter claiming illness and asking her to come to Brazil. Speculation was rife that his motive was that his mother had finally shut her purse to him and refused to come to his rescue yet another time, And, if she would not give it to him he had to take it at any cost. The search for Jasper Nelson began, with telegrams crossing the country for information about him. It was learned he might be in Cape Girardeau, Missouri. Sheriff Cleary and his deputy named Vandever headed west of the Mississippi. The detectives stopped by Renfro’s Saloon in Cape Girardeau to buy cigars. And there in the bar sat Jasper Nelson. Jasper was a talkative sort who seemed happy to talk to reporters. One described him as “having the appearance of a person of a generous open bearded fellow,” though one exhibiting signs of recent dissipation.” A man of about 40, Jasper wore an overcoat and slouch hat as he spun his tale. He had left Anderson on August 30th and stayed in Brazil for about ten days. From there he went to Marshall, Illinois and Casey. He returned to Terre Haute briefly on September 12 to see P.T. Barnum’s Circus. He turned to Terre Haute a short time later to attend a séance at Pence Hall. Jasper said he did not know his mother had died until the detectives arrested him. When Vandever told him to tell the story about his visit from the spiritual world, Nelson demurred, but the detective told them that Jasper had recounted a visit in which spirits came to him to tell him of his mother’s death. Jasper was about to jump off the steamboat taking him and his jailers to St. Louis when a spirit cane to him. The spirit told him that she was killed by a blow to the head by a club, and then two men doubled up her body and placed in a wagon. It was then taken to a hill and dumped in a ravine. Later, Jasper said it was not a spirit visit, but was the result of a dream he had while experiencing delirium tremens while drunk. Evidence against him included money he could not explain and that one of the three trunks found after he was arrested included one belonging to his mother. There were also reported sightings of him back in Anderson after the murder and flashing money around. It was averred that he was trying to sell some of her goods around Madison County. The prosecution felt there was more than enough evidence to take before the grand jury when it convened on November 26th. There was little doubt in the minds of most that Jasper Nelson, bad, drunken character that he was, had committed matricide. But Jasper had hired A.J Kelley, Terre Haute’s finest defense attorney. Kelley assured the jury that the evidence was all circumstantial and no witnesses had placed Nelson at the crime scene. The jury agreed. Jasper Nelson was set free. Many were still convinced that Jasper Nelson was indeed involved in his mother’s death, some how, some way. He was a “fiend incarnate” whoslew his own mother! But detectives had to continue their search. They already had another suspect that they felt had colluded with Nelson, one who was very familiar with Susannah Nelson. Jasper celebrated his release by getting drunk ina Terre Haute Saloon and ebgaging in a brawl there. Perry Manis was from a good family in Madison County, but like Susannah he had strayed upon shadowy streets. Manis was originally a farmer. At some point he became a “sort of preacher,” a preacher with a shady character avoided by many. How he became acquainted with Susannah is hard to say. Most likely it was through her “business.” But by 1883 they were on “intimate terms” and he was sort of her advisor in matters both spiritual and corporal. He was the man who left Anderson and traveled with her on the interrupted and lethal journey. It was Manis who urged Susannah to sell up in Anderson and start a new life in the west. He was seen with her in Indianapolis and Terre Haute but then quietly disappeared. Back in Anderson after Susannah went missing, he was carrying over $600.00 in his wallet, quite a sum for a man not known to have much. There he bought a new buggy for himself and showered family and lady friends with gifts. One of the gifts was a lap robe belonging to Susannah that he courteously gave to a lady to warm her during rides to the country in his new wagon. It was more than enough evidence for Terre Haute detectives to have the Anderson police arrest and hold Manis until they could move him to Terre Haute. A prisoner who shared a cell with Manis in Anderson averred that the sort of preacher had confessed to the killings. Manis told him, he said, that he and Susannah had gone to Indianapolis, staying one night at a house on George Street there, them went on to Terre Haute. There, he and Jasper Nelson killed Susannah and paid two men who knew the area to secretly bundle the body across the Wabash and bury it. Manis was sentenced to life in prison in January, 1884. Inhis case, life was only three years as he died in 1887. There is little doubt that others were involved as Manis alleged, but they were neither found or punished. Jasper Nelson would reappear in Terre Haute in 1891, this time as a traveling salesman peddling electrical supplies. He told those who asked that he had been “out west” for a while. He did not speak of his mother. The rest of Susannah Nelson’s body was never found. The macabre discovery of the severed foot still laced in a woman’s shoe caused heads to swirl. Coroner Drought immediately made plans to cross the Wabash once more. Perhaps this was the clue he had hoped for. He climbed onto his wagon, clattered across the wooden wagon bridge, and pushed his way through the rutted path that was the “grade” leading to Macksville. Passing the McIlroy store, where the crime was being endlessly haggled over by the customers, he tugged on the reins and turned north onto the Paris Road heading to the crime scene near St. Mary’s. He pushed through the woods looking for the stump acting as a makeshift bier for the foot. Nothing was there. The foot was gone. Frustrated and angry, Drought could do no more than return to Terre Haute to begin the process of solving the murder. Meanwhile, word spread of the grisly murder. Rumor chased gossip, gossip followed speculation, speculation hied its way throughout the area. Seemingly everyone whispered their own particular theory of events. Some were sure the victim must be a stranger. Others believed the killer had to be local. Only someone familiar with the area would know it was the perfect, secluded place for a murder and disposal of the body. More than a few were certain that the woman was a prostitute. After all, there had been a bagnio (brothel) not far from the murder scene. It was a place, they recalled, where “lewd women found an abiding place” that catered to the woodchoppers, miners and farmhands. Remember, they said, it was run by that awful madam who came over the river from “Happy Alley,” a brothel strewn street in Terre Haute’s notorious west end. Older residents dredged up the seedy past of the area. There was always something shady going on in that area around St. Mary’s. They remembered that during the Civil War some boys found a corpse hanging from a tree near the present murder scene. His feet had been chewed off by wild dogs and hogs. And they never figured out who he was or why he was killed. And that damn family named Trader had terrorized the area. One of them was always stirring up trouble, including one who committed murder. They were a lying, stealing bunch of outlaws. The whole lot of them. They were a scourge. And there was the murder of poor Eva Peters in Godseyville (https://wthhistory.wordpress.com/?s=godseyville). And a few years back those fellows wrecked a train at St.Mary’s that killed the brakeman (https://wthhistory.wordpress.com/?s=murder+at+st+marys). As the gossip flew, Drought and the police tried to piece the facts together. A local doctor named Morehead served as sort of a pioneer Crime Scene Investigator. A fractured skull was the cause of death. He affirmed to the coroner court inquest his initial thought that because of the strands of grey hair left on the skull and bonnet the woman was in her 50s. Her clothes indicated that she was a “woman of at least ordinary means” and the fact that she was wearing a bonnet likely proved that she was not murdered in her home, but near the scene of the crime. Dr. Morehead, affirmed that he believed the woman had been dead 6-9 weeks before her body parts were discovered. Meanwhile a sort of rudimentary investigation continued as officers tried to gather information. Three citizens came forward with information. A couple named King and a man named Davis lived just across the river from the murder scene. All three reported that about two months earlier the pitiful screams of a woman were heard wafting across the Wabash. They made a horrible, terrifying sound, they said. At that time they reported the screams to the police, who reportedly went to Sugar Creek but found nothing. One wonders why, if the screams could be heard across the river, no one near the scene told of hearing them. Was it just the air currents carrying the horrifying sounds east toward Terre Haute, or were Sugar Creek residents just too indifferent or scared to seek the source of a woman’s death throes? Who was the victim? People were asked to report any women who might be missing. A Mrs. Jaycox contacted police to say that her sister, Mrs. Moore, matched the description of the dead woman and had been missing for weeks. Hope flared briefly because police knew that identifying the victim was a key step forward to identifying the slayer. But soon a telegram arrived from Mrs. Moore to her sister, saying she was alive and well and visiting relatives. On November 3 the Terre Haute Saturday Evening Mail reported that police sources were leaking the information that they thought the victim might be Ida Nichols of Sugar Creek. A year earlier she had filed a suit for bastardy (fathering her child out of wedlock and refusing to acknowledge he was father or support the child) against a man named Mickleberry who lived near the scene. The suit was hotly contested and required several changes of venue due to its notoriety. On the day the case was to be tried she had disappeared. Some thought she left home that very day. Reportedly, she left with a man named Cole who had agreed to marry her and adopt the baby. Neither was heard from again. The Nichols story had a certain ring of possibility, except for one key feature. I checked census records and the only Ida Nichols listed in area was twenty years old. She certainly did not fit the description of a woman in her fifties with grey hair. That was the last real “break” in the case. Interest in the murder began to die away. There was little hope of solving the case, as an article in a Terre Haute paper noted:. But about a week after everyone thought it was to become just another “cold case” in the police files, another horror without solution, a clue appeared out of thin air. On a stump at the scene (possibly the same one that once held the severed foot) someone had placed an insurance policy containing the name of an older woman.